The cast is really good, Shan, Meesha Shafi, Ali Azmat, Shamoon Abbasi and Ayesha Khan. All good looking men and women. The flick’s been produced by Hassan Waqas Rana and Jameel Ahmad and directed by Bilal Lashari. Mind it the movie is in English so international audiences (English speaking) will have no problems understanding it, save for a few odd sentences in Urdu or Pashto. But I would not mind subtitles in different languages. The story is good and aptly describes the situation Pakistan is in today. This print is super awesome, its not the usual Pakistani flick with pathetic print quality and with Dolby Surround Sound the experience is superb. So as the story goes, Shan is a retired Major (Pakistan Amry, Special Operations) and very decorated and professional soldier who happens to get hold of a most wanted Indian sponsored terrorist Ramal (Shamoon Abbasi). Being the straight soldier Mujtaba (Shan) hands him over to the law. Ramal escapes from captivity and kills Maj Mujtaba’s wife and child, Mujtaba merely escapes death. He is from the beginning of the movie grappling with life, not easily. Amjad Khan (Ali Azmat) is a straight politician imbued with the dream of creating a dam for Pakistan to cater for its energy and water resource needs. Amjad despite being married gets entangled in Laxmi’s tresses (Meesha Shafi). Laxmi happens to be an Indian spy aka RAW agent. The damsel sure knows them sultry moves, and she is one wicked vixen. The Special Police team comprising of Ehtesham (Hamza Ali Abbasi), Javeria (Ayesha Khan), Kamran Lashari and Ali (Bilala Lashari) rescue kidnapped personnel while terrorists attack various institutions in Pakistan killing innumerable civilians. One of the bad guys is caught alive and breaks down to Maujtaba’s tough antics revealing the brains behind the massacre. 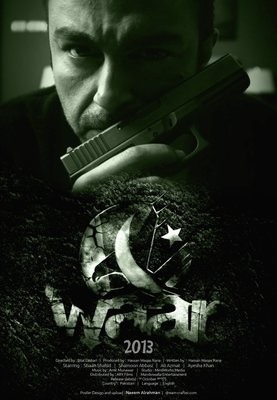 The team vows to take on terrorists and launches a joint Army/Police attack killing them all. Meanwhile Ramal, after having successfully given enough bombing material to Waziristan based terrorists escapes and lands in Laxmi’s lap. Both make out, and plan further attacks. Finally, as PM is announcing new Foreign Policy in Islamabad Convention Center, Mujtaba discovers a hard piece of evidence linking Ramal to the Conference venue. Both he and Javeria go to the location in search of Ramal and verily find him there. Javeria being the computer expert hacks in to the system running the bomb activation software, while Mujtaba and Ramal fight it out on top of the Convention Center. Just as the bomb gets defused Mujtaba defuses Ramal. The story is good, lots of action and strong language this movie is for adults only. And it does strive to bring alive the dying national spirit in its viewers, quite successfully. Not much in store for music lovers, this ain’t your average love birds talkie. This is a noble effort for revival of the dead cinema in Pakistan. I just hope they “carry on” with the good work. I would rate it “two thumbs up!” So what are you waiting for, book and ticket and get going if you still haven’t.